34th International Geological Congress | Geoconferences (WA) Inc. Thanks for the JH Lord Travel Grant so that I could travel to Brisbane and joined the 34th of International Geological Congress as part of my important expenses had been covered. In the congress, I presented an oral presentation titled “Quantifying spatial relationships between gold mineralisation and relevant control factors, St Ives goldfield, Western Australia”. The presentation showed a simple but useful approach to quantify the spatial relationships between gold mineralisation and plausible controlling factors in the St Ives area, Western Australia. 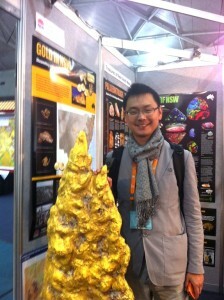 Our results showed that 1) the small scales faults have stronger spatial correlation with gold mineralisation, while the secondary faults didn’t show any significant spatial correlation; 2) the felsic to intermediate intrusive rocks in the area showed high spatial correlation with gold mineralisation, whereas the greenstone played as common environment for gold deposition. Also, a predictive mapping was generated for the entire St Ives area for mineral potential targeting, and the southeast area was found to be an interesting area with high potential of gold mineralisation. During my presentation, both the methods and results were interestingly discussed, as well as some positive feedback. Not only my presentation, but also many other related topics are interesting and I joined most of them. I also talked with some industrial companies about some advanced techniques which possibly improve my research.